Your Samsung Galaxy S6 Edge (#Samsung #GalaxyS6Edge) has a stunning display, which uses the latest AMOLED technology; colors are vivid and natural. However, of all its components, the display is the most fragile and can easily get damaged. The fact is we already received a lot of reports from our readers and most of them are seeking help how to retrieve data from their devices that have cracked screens. The first problem I tackled is about that. One of our readers want to transfer pictures from her Galaxy S6 Edge but she doesn’t know how to do it because the screen broken. 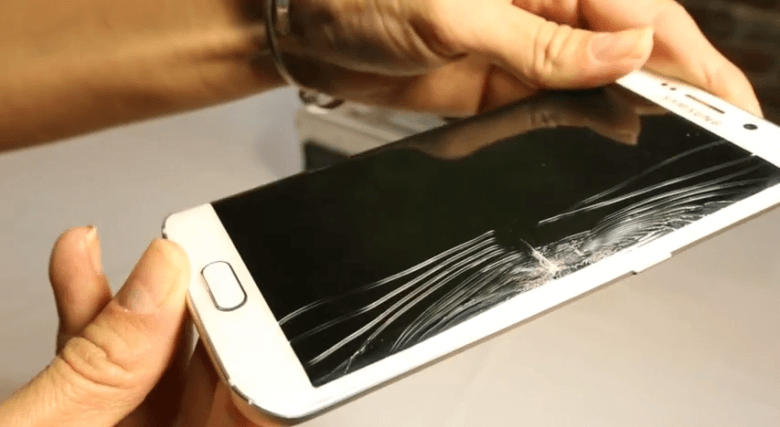 Read on to learn how to retrieve data from a Galaxy device that has a cracked screen. If you are trying to find a solution to a different problem, visit our Galaxy S6 Edge troubleshooting page. It contains all problems we already addressed before. Find one that is related to yours and try the solutions we suggested. If they don’t work, then you may contact us by filling up this questionnaire. Please provide as much information as possible so it would be easier for us to help you. Problem: My screen cracked, phone is working but I can’t see anything, I want to transfer my pics, etc but can’t because I am unable to unlock my phone. Is there anything I can do? Login to Find My Mobile using your Samsung account. On your computer, download and install Kies. Once you have logged in to Find My Mobile, you will have an option to unlock your phone. After you’ve unlocked your phone, you can then connect it to your computer and use Kies to extract whatever data you want. Related Problem: I so loved my Galaxy S6 Edge but I wasn’t too careful and dropped it on a cemented road. The screen was broken leaving it all black but the phone stays on; I can still hear the notifications when I get messages and when I tried calling it using my brother’s phone, it rang. I have a lot of very important pictures in it that I want to recover. How can I do it? Or, can I even recover them with the cracked screen? Problem: Hi. I bought a Galaxy S6 Edge for about 2 weeks ago. The problem started today. When I went in to any places like general or even go in to message I can’t go back by the touch I have tried to reset the phone and turn it on and off. My father have the same phone and doesn’t have this problem at all. What can be the problem? This is also the first Samsung I have but now I this it has been a big mistake by buying this phone. Troubleshooting: For a brand-new, 2-week old phone, this problem should not occur. The best thing you can do is perform a master reset to see if the problem gets fixed after that. If so, then it might have been caused by an app you installed or a firmware glitch. However, if the problem remained after the reset, then you will have to return it and have it replaced. Problem: The screen timeout on my device seems to always reset to 30 seconds. When i go in to change it to something else (3 minutes or 5 minutes) it will revert back in a 24 hour period to 30 seconds. It has done this since I got the phone and is quite annoying. I don’t know if that is a power saving function or is there something wrong with the phone or software/operating system. Any help is greatly appreciated. Scroll to Lock screen and security section and tap Secure lock settings. Set it to a higher value than the screen timeout. Problem: The screen went completely black for about a day, I was listening to music in Google Music, left it alone, came back to life next day. The phone was on, I could hear it on call it and was able to get call but screen was black not able to see anything had same problem with my son’s Galaxy S6 Edge and returned to the store. Suggestion: We really don’t know what happened to your phone but based on reports, this behavior is often caused by a system crash, however, in your case, the phone was still responding. But in case it happens again, all you got to do is press and hold the Volume Down and Power buttons for 20 seconds together. The phone will force restart and perform a simulated battery disconnect. This will bring your phone back to life. Problem: I love my Edge, except for weird touch problem. I’ve had the phone for about 2 weeks and it’s done this straight out of the box. When I press an app icon, or a card in a game of solitaire, the icon seems to move around slightly. I may have to touch it 3 or 4 times before it is still enough to register that I’ve touched it. Especially annoying when playing the game. Small problem in the scheme of things, but still… I have not had touch problems with the keyboard like some others. I also have had the problem with swiping the edge as some, but saw your answer to that one. Hope there’s something that you can help me with. Thanks. Troubleshooting: Maybe the phone randomly freezes, lags or hangs that’s why it couldn’t respond to your touches. In this case, it’s not really a touchscreen issue but a performance problem. It occurs when there are too many apps running in the background or there are too much data the phone needs to manage but either way, the problem can be solved by a master reset. However, if the problem was indeed a touchscreen issue, all you got to do is isolate the problem. More often, rogue apps or those that frequently crash may interfere with the phone’s primary functions. So, boot your device in safe mode to disable all third-party apps. Once in safe mode, try to use the phone and observe closely if the touchscreen issues still occur. If they don’t, then third-party apps have something to do with it, otherwise, it’s all the firmware but either way, still, a master reset will fix the problem. Problem: I recently purchased a screen protector and since doing so I have to press the screen real hard to use. Is there a way of increasing the screen sensitivity in order to press a more freely? Answer: In your case, it’s the screen protector that affected the sensitivity of the touchscreen. I understand it’s newly-installed but if you can’t use your phone properly because of that, it’s better to get rid of it. About the sensitivity setting, well, Samsung believes that its flagship’s screen is already very sensitive and took away the setting for it. So, you really can’t adjust the sensitivity in your Galaxy S6 Edge. Related Question: I tried to change the screen sensitivity and went to settings and display it’s not there. Problem: Frequently, while making a call or using an app the screen switches to a split screen away from the app screen I had open. In these cases, the recent button or return key don’t work. I have to press the home key and then re-open the app. But then the screen switches to a split screen again. What can I do? Under Device, tap Multi Window. Toggle the Multi Window switch to Off. Hey so I got Kies downloaded onto my PC, and I unlocked my device remotely through the Find My Mobile website, however, whenever I connect my device to the PC, the Kies app tells me that my device is still locked. I have a Galaxy S6 and I know my device is unlocked, I memorized my home screen and I am able to play my music freely, so my question is, how do I bypass this? the question is: there is any way to turn on the usb debug mode using only my pc and usb cable conected to the phone?? i want it to do screen mirroring, by this way ill be able to use it till i buy a new screen for it.